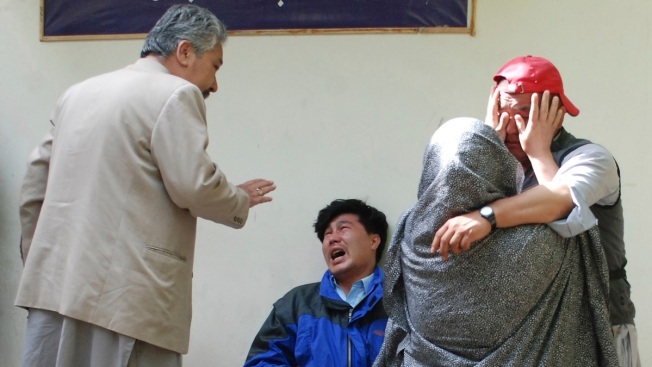 Family members of the blast victims comfort each other outside a mortuary in Quetta, Pakistan, Friday, April 12, 2019. A powerful bomb went off at an open-air market in the southwestern city of Quetta on Friday, police and hospital officials said. They also denounced the violence by Sunni extremists who have killed hundreds in similar attacks over the past years in Baluchistan province, where Quetta is the capital. "It seems people from the (Shiite) Hazara community were the target," said senior police chief Abdur Razzaq Cheema, adding that some of the victims were in critical condition. Mir Ziaullah Langau, the provincial home minister, said the suicide bomber had walked up to the marketplace and killed both Shiites and Sunnis. No group immediately claimed responsibility for the attack, which took place in the Hazarganji neighborhood, but Sunni militant groups have claimed similar bombings in the past against Shiites, whom they view as apostates deserving of death. Cheema, the police chief said at least eight Shiites were among the dead, as well as a paramilitary soldier and seven other people. Four paramilitary troops, who were guarding the open-air fruit and vegetable market, were among the wounded.